The focus of my trips is on Route #1 and Route #2. I also am thinking of skipping Ifaty for Mauritius if time permits. This national park is located 3 to 4 hours from the capital. 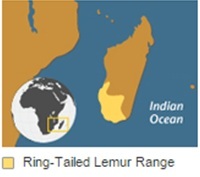 It is the home of the largest Lemur, the Indri, and 10 other Lemurs. The Indri is popular for its call. This is one of the most popular parks given its proximity to the capital. If you want to avoid the crowds, it is best to go to Mantadia (15 km north of Andasibe on bumpy road). Andasibe is fairly flat with a more varied terrain at Mantadia. You can in one day combine all of these different trails. One way to get really close the Lemurs is to visit/stay at the Vakona Forest Lodge. They raise Lemurs that were once pets, and as result, they can’t be released into the wild. Ranomafana National Park is the home of the Bamboo Lemur and 11 other Lemur Species. While some circuits can take days, one of the shorter (and thus more popular) routes is known as the Varibolomena circuit, which takes about 4 hours. The park is easily accessible along some of the more “major” roads in Madagascar. Most tours drive from Andasibe-Mantadia National Park to Antsirabe (Day 1) and then to Ranomafana (Day 2). From Ansirabe to Ranomafana, most tours stop in Ambositra, a woodcarving center. The trip to Isalo National Park takes about 7.5 hours driving, and Anja Community Reserve is probably the most common stop on the trip. To see the Ring-Tail Lemu, most people visit Isalo National Park, but it also possible to see them here. Anja Community Reserve is located about 1/3 of the ways towards Isalo National Park, and it appears most tour groups simply stop here for about an hour or so. This National Park was often compared to the American South West, such as Zion National Park. From my research, most travelers spend anywhere from 2 days plus in the park. This park is best known for the Ring-Tail Lemur and the Vistas. Ring Tail Lemurs are only found in South / South-West Madagascar, and this is probably the most common park to see the Lemur. I also recently found that the “Dancing Lemur” aka Sifakas is found in Isalo National Park as well. Piscine Naturalle (aka Black and Blue Pools) – Pools. Since these are the most popular activities, it appears that most people do a canyon walk on 1 day and walk in the pools the other day. It would take about 5 hours to reach Airport to fly to capital and/or fly to Tsingy. This location has some of the most beautiful rock formations in the world. They are simply spectacular. The park is only open during the dry season from April to November, and Grand Tsingy is only accessible between June and the beginning of November. The primary question is whether the pain of getting there and is worth the beautiful visuals. If you have only one day, the Big Tsingy is the must-see attraction. One person on Trip Advisor indicated that she would have tried to see both Petit and Big Tsingy in one day. This most likely would be my goal once I travel to Madagascar. Given the pain in getting to park, I think many people want to spread the adventure over two days. Entry price is pretty cheap at $10 per day and discount is given if staying 2 days. You must have a guide in the parks. From my quick research, there are budget accommodations and some more high-end locations that will cost upwards of 70 Euro a night. This is located 45 km north of Morondova and on the ways towards Tsingy. The best time to view the trees is at sunset. Most people raved about the trees and plan to stop here on the way back from Tsingy in time for the sunset. There were some complaints that there are too many tourists/locals around the park. Since it is on the way from Tsingy, it appears to be a can’t miss stop. The driving distances between locations in Madagascar is quite long and flights are very unreliable. From the suggested itinerary below, you will have only 5 days of actually enjoying the sites and the other days getting between locations. If only spent time in Madagascar, I think you could keep the hectic schedule and visit one of the coastal cities Nosy Be or Ile Sainte Marie, or you could add time in Andasibe, Ranomafana, Isalo National Park, or Tsingy. I could see adding a day in all of these locations. If I added a day in Andasibe, I would probably not add day to Ranomafana or vice versa. I think it is fairly similar experience. After doing more research, I think the ideal solution is a 2.5 to 3 week vacation to give you enough time to explore Madagascar including a nice time at the beach.